Just a 15 minutes' walk from Edinburgh Medieval City, The Albyn Townhouse offers 4-star, family-run B&B accommodation with king-size beds and full Scottish breakfasts within a 4-storey, 19th-century town house. Only 300 metres from a dock in Sliema, Blue Haven Apartment features a garden. Providing apartments with free Wi-Fi, the property is 2 km from Fort Manoel and 5 km from La Valletta. 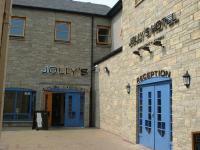 Jolly's Hotel is 500 metres from the sea in Broughty Ferry, 3 miles from Dundee. It offers comfortable rooms with free Wi-Fi, 3 bars with regular entertainment and free parking. Set in beautiful flower gardens, the family-run Eversley Hotel offers home-cooked food and a swimming pool. The hotel is nestled at the foot of St Boniface Downs, next to Ventnor Park. The Eversley features a compact fitness centre with a jacuzzi. South Kensington Underground Station and Chelsea Football Club are 15 minutes' walk from these spacious apartments. The London Suites each feature kitchen and living areas and 2 balconies. Prince of Wales Southport Hotel is an elegant Victorian building with landscaped gardens, combining traditional character with modern luxury. All 143 en-suite bedrooms are tastefully designed with Victorian style. The restaurant serves excellent traditional fayre dishes. There is free Wi-Fi and a magnificent ballroom. The Alexander Thomson is located in Glasgow, Scotland. 50 metres away from Glasgow Central 400 metres away from The Lighthouse Centre 500 metres away from art galleries Hotel Features. Breakfast provided 24 hour front desk Multilingual staff Guestrooms. The East Beach Hotel is at a prime spot on the Eastbourne seafront, located on Royal Parade and overlooking the beach and Eastbourne pier. Enjoy a glori ous location on the South Coast. This Mediterranean-style resort offers panoramic views of Albufeira. Fisherman's Beach (Praia dos Pescadores) is about 400 metres from Almar, and traditional products can be found in the nearby shops. Features of the apartment hotel include a bar, garden, terrace, outdoor swimming pool and children's pool, laundry, Wi-Fi and free public parking nearby. The Barns Hotel is situated in a beautiful riverside location, within three and a half acres of landscaped gardens, yet it is just 10 miles from the M1 and 8 miles from A1. The tranquil setting offers Bedford accommodation with views of the great River Ouse and the local country park and wonderful grounds in which to stroll and relax.